Harry is now the Winter Knight, the ultimate warrior (so to speak) for Mab, the Queen of Air and Darkness. And after months of “physical therapy” (i.e., trying to kill Harry in every imaginable way possible) she tasks him with his first assignment as the Winter Knight: kill Maeve, Mab’s daughter. Harry travels back to Chicago to find that the world had changed since his “death”. Friends and allies were no longer such, and those he once counted on in dire circumstances were now his enemies. Harry also learns that a massive war between the Outsiders and the forces of Winter are the only thing which keeps the mortal dimension in one piece, and discovers that something far more insidious — and dangerous — had occurred. Led by the mysterious Cait Sith, Harry must acquire all that he needs in order to complete his mission for Mab before Maeve, or anybody else for that manner, finds out. Harry is almost immediately beset by the Summer Knight when he reaches Chicago after touching base with all his loved ones — except for one in particular. The Summer Knight is there to kill Harry, as Summer and Winter are wont to do. But Harry manages to convince his old friend Twitch (the Summer Knight) to hold off until the time is right. Harry’s half-brother, Thomas Wraith (white court vampire), also manages to convince the Lady Summer to wait as well. Harry suddenly finds himself trying to figure out just why Mab would need Harry to kill Maeve when the Queen could obviously do it herself. As the plot thickens, so does the danger that Harry and all his friends face. Butcher gets back into stride after the rough outing in the previous novel, with Harry in full command of his magic and self once more. The powers and influences of the Winter Court are evident throughout, as Harry becomes more and more of a Winter Knight and less of himself. Aware of these inner changes, Harry struggles to keep his identity and sense of self throughout. The author does a magnificent job of pitting Harry’s humanity with the self-gratifying needs and desires of what being a Fae entails. Harry struggles, fails, and struggles again until he finally comes to terms and accepts that while he may be the Winter Knight, he is still Harry Dresden. Part of the enjoyment of this novel is watching the struggle take place within Harry. He knows it is happening, yet it is careful and subtle while changing his feelings and emotions towards things. He slowly becomes more primal and cunning, while relaying less on his inner set of morals that have helped him stay strong throughout the series. Delving into what may have happened had Harry followed his old mentor, Justin, the author opens up a new side to Harry — one that the character is terrified of being. 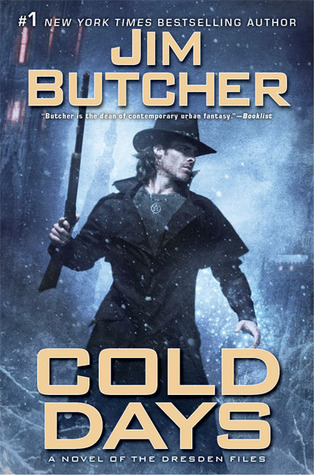 Well-paced and filled with action, suspense and a surprise ending that even I didn’t see coming, Cold Days is a wonderful and welcome edition to the Dresden universe. A definite must-buy for any fan of the urban fantasy genre. This entry was posted on January 7, 2013, 6:08 pm and is filed under Book Review. You can follow any responses to this entry through RSS 2.0. You can leave a response, or trackback from your own site.